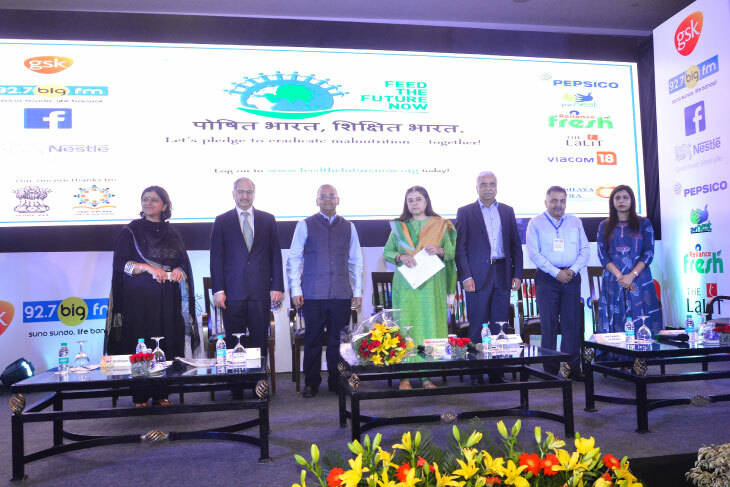 On May 27, 2017, the eve of World Hunger Day, Akshaya Patra launched a nation-wide movement called Feed the Future Now – this campaign is supported by nine leading corporates and the Government of India. Christened as ‘Feed the Future Now’, this movement is set to serve 5 Billion Meals to children across India by 2020 with a view to create a ‘Poshit Bharat, Shikshit Bharat’ (Nourished India, Educated India). The movement was flagged off by Hon’ble Minister for Women & Child Development, Smt Maneka Sanjay Gandhi. The launch was also graced by Shri Amitabh Kant, Chief Executive Officer, NITI Aayog; Mr Shridhar Venkat, Chief Executive Officer, The Akshaya Patra Foundation along with the CEOs and senior representatives of nine leading corporate partners; GSK Consumer Healthcare, Nestlé, PepsiCo India, PVR Nest, Reliance Retail, Facebook, The Lalit Group, Big FM and Viacom 18. At the launch, each partner pledged to drive initiatives that raise mass awareness about need for the right nourishment among children. To meet key global nutrition milestones, future growth requires significant investments critical to ensure school going children don’t drop out due to direct and indirect impact of hidden hunger and micronutrient deficiency. To know more about Feed the Future Now, click here.